With more power in the hands of the patient, what are the long term implications of the consumerisation of healthcare? Before we dive straight into the complexity of healthcare consumerisation, and the intriguing trends that are redefining what medicine is, I’d like to make two propositions. First, that the idea of patient-driven medicine is nothing new. Many of us will be familiar with the scenario of walking into the doctor’s surgery, google print out in our hand, demanding specific treatment for a self-diagnosed condition, casually ignoring the frustration this causes doctors. “Nobody knew healthcare could be so complicated”. Patients’ inherent aspiration to take care into their own hands could explain the growing trend in personal analytics, or ‘self-quantification’. This trend is propelled by a variety of new self-diagnosis tools, accessibility to information/treatments and self-tracking technologies. One side of the story is of technological innovation and exciting products. The other side, slightly more complex, is the change in dynamics and the sensitive relationship between patients, doctors and payers. With more power in the hands of the patient, what are the long term implications of the consumerisation of healthcare? It is hard to ignore the proliferation of new products released into the market. Last year, the US Food and Drug Administration approved 36 health apps and devices, from mobile lung-function monitors to blood-glucose tests. Start-ups are building smartphone stethoscopes, ophthalmoscopes to examine eyes and otoscopes to look inside your children’s ears. The CliniCloud, for example, is a microphone that slots on to your phone to turn it into a digital stethoscope. In clinical trials, it exceeded human doctors’ ability to diagnose chest infections. A mobile ultrasound scanner, Lumify, made by Philips, turns your smartphone into an imager allowing self-scanning of your body’s organs that would normally happen in a $350,000 ultrasound machine. Other businesses choose to tackle inefficiencies by understanding human behavior. Medisafe (a shameless plug here for an Octopus Venture portfolio company) uses data to study patients’ adherence and help them comply with their often-complex medication regimes. These products could potentially solve major problem costing healthcare systems trillion of dollars. They are also automating tasks that have been historically performed by humans, including doctors. In the future (and some will assert even today) they will perform those tasks better. So how does this trend impact the industry/patient relationship? Firstly, personal analytics is no longer just for the enthusiastic hypochondriac. The technologies outlined above are of a different order to the results of a google search. For the first time, the possibility that a patient might know their own body better than a professional has to be considered. Transparency is appearing where gatekeeper-held information previously made the patient just a passive recipient. Now AI allows for accuracy and precision, speed and volume, not to mention reliability. (Medical error kills about 1,000 people a month in the UK and is the third biggest cause of death in the US, according to a 2016 study in the British Medical Journal.) Patients are becoming better informed and better able, backed by AI, to self-diagnose and self-treat. Technology is also linking patients to treatments and clinical trials they wouldn’t otherwise have had access to. Clearly, this creates many new opportunities for entrepreneurs — or does it? Unfortunately one of the fallacies entrepreneurs must overcome is the belief that the healthcare sector is driven by products in the way others like software or consumer goods are. In healthcare, the patient usually doesn’t pay for the treatment, rather the health service or insurer does. In addition, the patient lacks the knowledge or education needed to choose the best product, by application or value, so patients historically outsource their decisions to others — namely professional doctors. Doctors themselves are then exposed to the influence of those who pay: the insurers or government body, who want to minimise cost and the pharmas, who want to maximise profits. 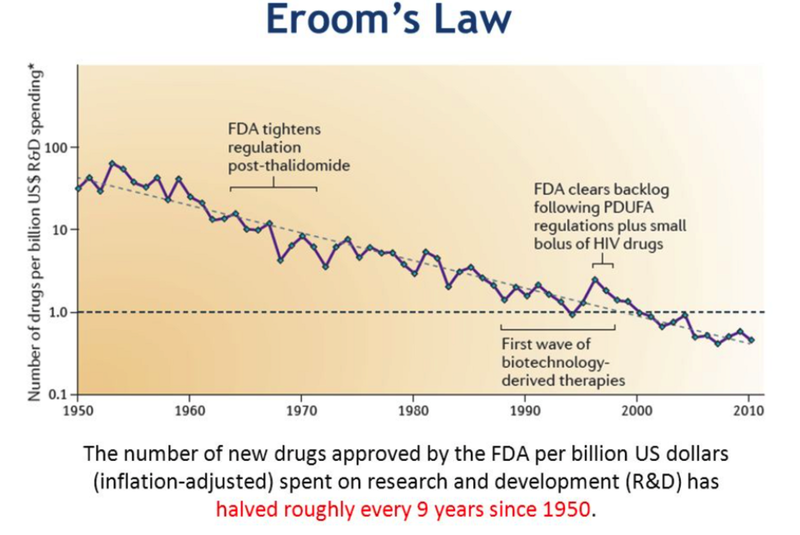 which observes that, despite improvements in technology, drug discovery is becoming slower and more expensive over time, adding additional pressure to the system. In many ways, the system is broken. So can it, given these complexities, be possible that patient-driven healthcare will fix it by creating a more sustainable, efficient and equable model, driven by the patient, for the patient? We might be light years away, but frankly nobody really knows. Innovation is now moving at a new and unpredictable pace. For the companies, big pharmas as well as small startups, reaching a patient has always been a hard task. Traditional marketing is crude, costly and highly regulated. The complexity and diversity of disease adds cost to the pharma’s efforts to connect to the relevant patients. The sickest can be the most ‘expensive’ to find as they are often out of the loop of traditional channels of communication. This is where a system flipped on its head, where patients are the ones seeking specialist treatment using the right discovery tools fuelled by AI, becomes a realistic and desirable vision. There remain many unknowns. Professionals will always be part of the picture, particularly as medical advances demand evermore specialist expertise. However, they will need to adapt. One possible benefit is clear: putting precision diagnosis in the hands of the individual brings the holy grail of healthcare efficiency a step nearer: the ability to predict and prevent disease before it affects health. Ultimately if the patient doesn’t win, nobody wins. 1. How and does digitalisation benefit the patient? 2. Is this health related care driven by business for its benefit? 3. Is the sector creating a new industry of parallel illnesses? 4. Is the aim to extend life (which is futile until dementia and ageing are resolved) or improve quality in our finite lifespan? Early detection of disease and prevention is to be lauded, but ultimately is self diagnosis (and possibly treatment) a dangerous precedent?. Who will take legal responsibility if there is a misdiagnosis? Who is going to field the plethora of presumed illnesses if there is going to be anxiety? ness? Can it deal with the cross over of the bodies systems and multiple co morbidities? The most valuable focus for patient’s in my opinion, diagnose’s true established disease early, optimises access and improves quality of treatment before dementia and ageing takes over. This is at complete variance to what serves business best, as knowing how the variability and presentation of disease is so complex it is hard to see how even with the mist complex algorithms, experience will be replaced. There is the potential to generate massive engagement in the more affluent world who are health obsessed eg. Gluten but does it benefits patients?